Phase Three “Smart” battery charging technology is now available in a wide range of power levels, allowing you to select the right size, features and flexibility you require for virtually any application from small recreational craft to large live-aboards, workboats and other commercial vessels. These chargers interact with batteries to put them through the optimum three stage charge process which provides for fastest recovery and ideal conditioning, maximizing battery performance and extending battery life. A selector switch adjusts output voltage to adapt for gel-cell/flooded lead-acid/AGM battery types. An optional temperature compensation sensor also adjusts output for ideal voltage based on changes in the batteries' ambient temperature. All models are housed in a rugged stainless steel case with a durable white powder coat finish, and the internal circuitry is polyurethane coated for maximum corrosion resistance. • “Smart” circuitry provides three stage charging—bulk, absorption, float. 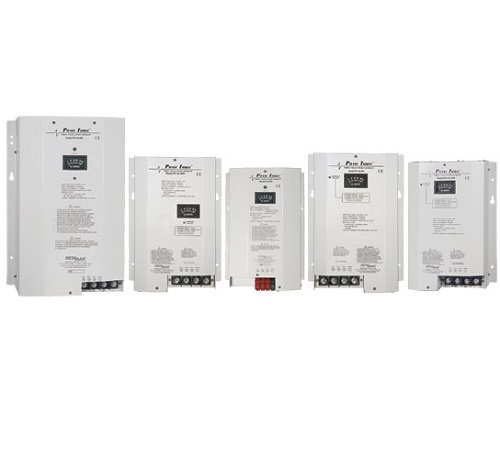 • Gel-Cell/Flooded Lead-acid/AGM battery type switch selects optimum charge/float voltages. • Current limiting-prevents damage from overloading. • Charger status clearly displayed with L.E.D. and/or audible indicators or optional remote panel. • Use as a power supply; can power loads without a battery in line. drip shield and marinized internal circuitry.